So, at half seven this morning I’m reaching for the Weetabix on the top shelf of the kitchen cupboard. Or maybe it was the cereal bowl in the cupboard next to that one. It might’ve been when I rattled through the drawer looking for my favourite spoon (I’m 47 and have a favourite spoon), but either way, as I was standing in the middle of the kitchen I was acutely aware of a sudden and deadening chest pain. Almost as quickly, it spread to my neck. From somewhere deep within, my buried knowledge of all I’d learned on first aid courses came magically, unexpectedly, flying back. So I sat down and ate my Weetabix and drank the coffee which I’d poured earlier and left to cool. Breakfast over, I went upstairs. I was in 2 minds whether or not to tell my wife. I felt kinda ok, but I knew something wasn’t right. I also knew how anxious and panicky my wife can get. And there was the not insignificant factor of my pal succumbing nearly two years ago to chest pains with tragic, devastating consequences. Before I knew what was happening, she was on the phone to NHS24, and straight back off again with a simple instruction. Five minutes later and I’m in my living room, dressed, wired up to an ECG monitor being worked by a paramedic and breathing carelessly through a nebuliser, with every puffy breath transforming my living room into the Top of the Pops studio from 1983. Then I’m in the ambulance. As the patient. 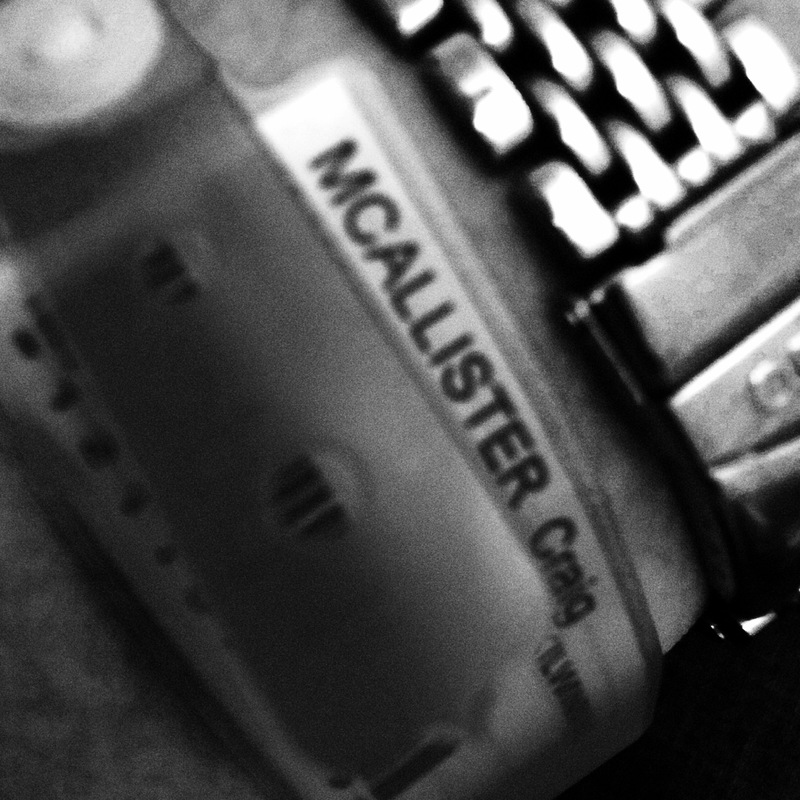 Wired up to more machines, watching as a ticker tape of spikey graphs spits from somewhere below where I lie. I’m trying to work out whereabouts I am. I know I’m going to Crosshouse Hospital but as we swerve round roundabouts I’m trying to picture my bearings and come to the conclusion that I have absolutely no idea where we are. I’d make a rubbish kidnap victim, I think to myself as the ambulance wheel clips the edge of a raised part of road. We must be near Springside, I reason. The next thing I know, I’m being wheeled out the ambulance, still on the bed and I’m crashing through the doors of A&E and along a corridor to a desk where one of the paramedics gives my details to someone while 25 or 30 medics stand around for their morning team briefing. Perfect timing. I’m taken to a curtained area where I’m poked, prodded, jagged, wired-up and x-ray’d more times than I can count. It’s been a long day – the longest day – and I’ve been further poked and prodded and jagged and wired up via those little electro patches that rrrrrrrrrip the hairs off whatever part of your body they happen to be stuck to. I’m fed up. Feeling ok but fed up. I’m still here. I just want to go home. Ach, I think I’m fine. Really! Hang in there! I love your blog. Perfectly written. Now, stay alive ypu eejit! It’s the double sided tape wot did it! Hope all is ok mate, look after yourself…. Hope all’s well, take it easy! Y’know…… you might be onto something. You’d better not die that Smiths thing you promised hasn’t been put up yet! But seriously, get it done and get better pronto. Ha, thanks! I’d forgot about that. Please give us an update soon. I didn’t know your name was Craig. Take it easy Craig. Your blog is one of my Sunday afternoon delights. Life has a habit of jumping on people when they least expect it. We’re both at an age where we’ve seen it happen to pals. Well done that wummin of yours for hearing what you said and doing the right thing. The bloggers I check in each week with.. Plain Or Pan, TNVV and Across The Kitchen Table…. I kinda think that mibbe one day we’ll all accidentally meet in some obscure bar in Oban, Port Charlotte or Irvine (or some such place) and find ourselves starting to chat about music. Gradually the conversation will get more animated… I’ll get ripped into slagging Junior Boy’s Own, Kitchen Table will slag off Billy MacKenzie’s final album, TNVV will let you know why he secretly loathed St Etienne and I’ll explain why Johnny Marr couldn’t beat Winged Eel Fingerling in an arm wrestling competition. Then a quiet unassuming figure comes in and wanders over to a jukebox none of us had noticed was there in the corner. We rush over and huddle round, The 7″ singles… Fiery Jack, Treason, Penelope Tree, Just Like Gold, Totally Wired, Poor Old Soul, Jocelyn Square, Candyskin, Bring On The Dancing Horses… hunners of 7″-ers… not a duffer on there… the music plays all night, the bar doesn’t shut, the barman leaves the keys and asks us to put the money in the till for our drinks “if we can remember” . We all think we recognise the stranger but none of us can actually remember his name. He was in some band or other… he is very entertaining… It is quite a night. Bloody hell, Craig. What’s going on? Hope everything’s okay. Might be worth letting Mrs Pan know that i’ve to get the record/cd units from our old work place. Just in case there is a repeat of your own personal episode of Casualty. Oh and can i get your Teenage Fanclub tickets for this weekend. Stay healthy. You better no’ be deid buddy cos I’ve just found your blog, maybe just in time for the 10th anniversary knees-up! How long d’you think it’ll take to catch up on 9 years of writing? Well, found a new way to get the cold winter night shifts in now, just so long as I don’t end up like some hipster beardy dude in the process! Was good to catch up recently at the Magnum, hopefully won’t be too long again. Which reminds me of the time me and Muirso (remember him?) came up with the bright idea one night, of going to the skating disco looking cool as fook…. and dress like Walt Jabsco! Out came our faithers’ black suits, white shirt, black skinny tie, black school shoes and shades. Unfortunately, no Pork Pie (still nowhere in Irvine you can get one of these) but we thought we looked the dog’s doo dahs walking up the ramp and into our audience. Ach well, canny win ’em all! Take care bud. pps, where’s all the cool smileys? All the comments! It’s great to have pals who care enough about you to stop and leave a wee message. I enjoyed reading them all, they brightened up my days as they popped up. Made my wife laugh too – “Who ARE these people?” she asked, not unreasonably. Bartholomew Carruthers? She knows now. If we ever meet in the actual real world, I’ll be sure to buy each and every one of you a large glass of whatever your tipple may be. Special ‘hellos’ to Sid Law – great words, and really appreciated – and to Scott Thomson, someone I hadn’t seen in , oooh, 30 years, then suddenly, there you are at a gig in the Magnum a few months ago and there you are again, dropping in on here. See you soon, I hope! Aye, it’s nice to have pals. Even the ones I’ve never met.